CRO - is using Smore newsletters to spread the word online. BELLWORK - Watch the video below. In this session we will explore 5 different types of digital presentation tools that will enhance instruction as we move away from PowerPoint. These will include Prezi, Powtoon, Nearpod, Smore, and Sway. 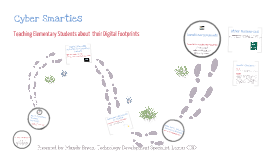 You will leave this session prepared to move beyond Powerpoint with digital presentations that can be created by both teacher and student. 4. How can we extend and enrich the learning of students who have demonstrated proficiency? Prezi is a non linear presentation tool that allows for zooming, embedded video, and much more. It's never too early to emphasize the importance of digital citizenship to our students. These are a few FREE resources I have found useful in the computer lab! Powtoon allows users to create a colorful, visually engaging animated presentation (cartoon mashup) with drag-and-drop simplicity. Nearpod allows teachers to construct presentations using the Nearpod website and deliver instruction to students by pushing content out to multiple devices at once. The teacher controls the presentation from a master device, while students follow along on their own device. You can upload Powerpoints you already have and make them interactive with questions, quizzes and even have students draw. Go to Nearpod.com and wait for Ms. Johnson to give you a session code to join. S'more is a one page webpage where you can put information, links to other sites, and students can add comments at the end of your page with items they liked or did not understand. This is a great way to pace a lesson and include all your material in one place. This "Beyond Powerpoint" page is an example of a Smore. Want some more info on how to make a S'more? Sway is part of your Office 365 subscription. Much like PowerPoint except they use "cards" where you can place pictures and information. ThingLink - ThingLink is a free, web-based tool and app that allows the user to upload an image and create interactive links to text, music, video, sound and weblinks. REFLECT: Click here to reflect & collaborate! CLICK HERE TO COMPLETE THE EVALUATION SURVEY!